Brucella is an intracellular pathogen capable of infecting animals and humans. There are six recognized species of Brucella that differ in their host preference. The genomes of the three Brucella species have been recently sequenced. Comparison of the three revealed over 98% sequence similarity at the protein level and enabled computational identification of common and differentiating genes. We validated these computational predictions and examined the expression patterns of the putative unique and differentiating genes, using genomic and reverse transcription PCR. We then screened a set of differentiating genes against classical Brucella biovars and showed the applicability of these regions in the design of diagnostic tests. We have identified and tested set of molecular targets that are associated in unique patterns with each of the sequenced Brucella spp. A comprehensive comparison was made among the published genome sequences of B. abortus, B. melitensis and B. suis. The comparison confirmed published differences between the three Brucella genomes, and identified subsets of features that were predicted to be of interest in a functional comparison of B. melitensis and B. suis to B. abortus. Differentiating sequence regions from B. abortus, B. melitensis and B. suis were used to develop PCR primers to test for the existence and in vitro transcription of these genes in these species. Only B. suis is found to have a significant number of unique genes, but combinations of genes and regions that exist in only two out of three genomes and are therefore useful for diagnostics were identified and confirmed. Although not all of the differentiating genes identified were transcribed under steady state conditions, a group of genes sufficient to discriminate unambiguously between B. suis, B. melitensis, and B. abortus was identified. We present an overview of these genomic differences and the use of these features to discriminate among a number of Brucella biovars. Brucella is a facultative intracellular pathogen that causes abortion in cattle, goats and sheep and a febrile illness ("undulant fever") in humans. Animal brucellosis is a serious problem worldwide and is endemic globally. In areas where it is endemic, human brucellosis is quite common but often not diagnosed. There are six recognized Brucella species that differ in their preference for certain hosts. B. abortus preferentially infects cattle, B. melitensis infects sheep and goats, and B. suis infects pigs. All three of these species, as well as B. canis, can infect humans, and B. melitensis is associated with the most serious human infections [1, 2]. The brucellae are grouped with the α-proteobacteria and are related to other cell-associated parasites of plants and animals. The classical Brucella taxonomy is based on six species (B. melitensis, B. abortus, B. suis, B. neotomae, B. ovis and B. canis) characterized by their host preferences. Later observations of high homology from DNA-DNA hybridization studies led many to adopt a monospecific system [3, 4]. The Subcommittee on the Taxonomy of Brucella also accepted this classification in 1986, along with the caveat that the classical species names should be used "to avoid confusion." Most researchers still prefer to use the species system, which recently has been given more credence by detailed biochemical and genetic studies . Macrophages are among the first targets of Brucella invasion, and the bacteria can survive within this naturally hostile intracellular environment . Macrophages are important in transporting Brucella to tissues throughout the host, where they can survive in a variety of cell types . Several studies have suggested that Brucella delays phagolysosomal fusion as a survival mechanism in macrophages, while in non-professional phagocytes Brucella appears to modulate the interior of the phagosome and evades intracellular degradation by avoiding the endocytic/phagocytic cascade . It is not known definitively where Brucella replicates within the vertebrate cell. Observations have suggested that Brucella replicates within the rough endoplasmic reticulum (ER) in several cell types, including trophoblasts  and Vero cells . It has been shown that lipid raft-associated molecules, such as glycophosphatidylinositol anchored molecules, play a role in determining the intracellular fate of Brucella . Studies identifying ER markers on Brucella-containing compartments have also supported the theory of the ER as the site of replication . The detailed mechanism of Brucella intracellular survival is not well understood and is assumed related to patterns of gene expression in both the pathogen and host. For example, most Brucella spp. are smooth due to expression of O-side chain genes, replicate inside macrophages and are virulent. In contrast, B. canis is rough, yet still capable of macrophage survival and is also virulent [12, 13]. In the interest of developing a DNA microarray optimized for comparative study of the brucellae, we have carried out a three-way genome comparison of B. suis , B. melitensis , and draft B. abortus  sequences, at both the nucleotide and predicted coding sequence (CDS) levels. B. melitensis, B. suis, and B. abortus each have approximately 3 Mb of genomic DNA, divided into a large chromosome of approximately 2 Mb and a small chromosome of approximately 1 Mb. We found that over 3100 genes identified in B. suis or B. melitensis appear to have a homolog in both of these genomes and also in B. abortus. Fewer than 100 genes were identified as present in only one or two of the three genomes, with an additional group of close to 100 genes having significant deletions in one or two of the genomes relative to the others. Annotated or predicted genomic sequence features that appear to distinguish the three species were probed using PCR and RT-PCR, to verify their uniqueness and to test for transcription under in vitro growth conditions. PCR primers were then used to assay and classify several variant strains. Differentiating genes will provide targets for rapid discrimination among Brucella species, as probes on a diagnostic chip, and will also be useful for elucidation of differences in host preference and mechanism of virulence among these closely related species. The genomes of the three sequenced Brucella biovars (B. abortus 9-941, B. melitensis 16 M and B. suis 1330) were compared globally to identify the extent of similarity between these closely related bacterial species. Our results for comparison of B. suis to B. melitensis (Figure 1A) were generally in agreement with those of Paulsen et al., 2002 . We further tried to pinpoint which of the potentially unique genes could also distinguish B. melitensis and B. suis from B. abortus, and would therefore be of interest as differentiating probes on an expression array, by including draft genome sequence from B. abortus in the comparison. Subsequent results of comparisons to the finished B. abortus sequence by Halling et al. , are in reasonable agreement with our results, though some minor differences in feature identification arose from our use of a draft annotation. Our computational and experimental analysis identified and confirmed a set of 22 ORFs to be present in B. suis 1330, but not in B. melitensis 16 M or B. abortus 9-941, and another 22 ORFs found in both B. suis 1330 and B. abortus 9-941, but not in B. melitensis 16 M. These differentiating ORFs extend a known set of 217 ORFs, which have been shown experimentally to differ in expression between the Brucella species in a B. melitensis 16 M based microarray experiment . Our three-way genomic comparison together with the genomic comparison performed by Halling et al. , demonstrates that B. suis 1330 and B. abortus 9-941 both contain the ORFs identical to BMEI1747, BMEII1071, BMEI 1746, and BMEI1896, BMEI1919-21, BMEI1923, BMEII0826, BMEII0850, and BMEI1662, which were shown to be completely or partially missing from either B. suis S100 or B. abortus S2308 or both respectively . Supporting previous findings that the three genomes are highly similar, the majority (>90%) of annotated genes were found to share 98–100% sequence identity at the nucleotide level with their apparent homologues in each of the other genomes. The majority of differentiating genes identified are in large (~20 kb) regions, which partly account for differences in chromosome size. Most of these genes have functional assignments in existing annotation. Table 1 provides a detailed description of the differentiating genes identified in this study, organized according to their order in the B. suis genome, or in the B. melitensis genome in those cases where there was no B. suis sequence match. Genes shown as present in B. suis and B. melitensis but absent in B. abortus mainly correspond to a large deletion in the genome sequence of B. abortus relative to the other genomes, which was previously identified by Vizcaino and colleagues , and identifiable in [GenBank:AF076290]. The identities of these genes were confirmed by comparison of that record to the draft B. abortus sequence. The GenBank Coordinates of observed Brucella gene differentials. GenBank coordinates of 102 differential open reading frames identified in the three sequenced Brucella species (B. abortus 9-941, B. melitensis 16 M and B. suis 1330) along with their names, sizes and predicted functions. We identified several multi-gene regions that contain the majority of differentiating genes (Table 2). These six regions alone are sufficient to discriminate between the three Brucella species. In a pairwise comparison, thirty-three regions were described as unique to either B. suis or B. melitensis . In a three-way comparison that included the draft B. abortus sequence, we find that many of these differentiating features can no longer be considered unique for the purpose of discriminating among the three species. Fewer single-species specific genes remain, twenty-two unique genes in B. suis and one in B. melitensis, which demonstrates the homogeneity of the genus. A complete list of differentiating coding regions is given in Table 1, and their possible significance is described below. Summary of RT-PCR results from differentiating CDSs Brucella species, grouped by differentiating island. Transcripts detected in each differentiating sequence island of B. abortus 9-941, B. melitensis 16 M and B. suis 1330, when the cell cultures were grown at 37°C for 36 hours in trypticase soy broth (Difco). Several CDSs homologous to components of an amino acid ABC transport system were found in B. abortus and B. suis but were absent in B. melitensis. This may indicate that B. abortus and B. suis have the ability to utilize a nutrient that B. melitensis does not. Different patterns of amino acid utilization are used to distinguish among the brucellae , and variations in amino acid transporter content are consistent with the observation that each species has a distinct pattern of nutrient utilization. Most of these genes are present on the differentiating region SA2 (Table 2), suggesting that the acquisition or loss of this region could have been related to a change in environment or nutrient availability for the ancestral species. Two ABC transporter permeases (BR0952/BR0953) unique to B. suis were also identified. Transcription of these genes in B. suis was detected by RT-PCR (Table 3). Detailed results for RT-PCR analysis of differentiating CDSs from Brucella species, by gene. Detailed breakdown of the transcripts detected in each differentiating sequence island of B. abortus 9-941 , B. melitensis 16 M and B. suis 1330, when the cell cultures were grown at 37°C for 36 hours in trypticase soy broth (Difco). A detailed analysis of a 50 kb region (BRA1072-1116/BMEII0183-227) was performed to complement our general comparison of gene content. This 50 kb region resides on Chromosome II of each Brucella species and may represent a composite transposon . It is flanked with insertion sequences that suggest a foreign origin, although its G+C content (56.8%) is close to the Brucella average. Although this island does not contain obvious virulence genes, it includes a large number of peptide ABC transporter genes. In some pathogens, autotransporter proteins have been implicated as virulence determinants ; whether this is the case for the brucellae has not been reported as yet. Comparison with B. suis shows that this region is also present in B. melitensis and B. abortus (Bricker, Acc. No. AF454951) but contains deletions in the dipeptide ABC transporter permease protein gene, the 3-hydroxyacyl-CoA dehydrogenase family protein gene, and a transcriptional regulator. Each of these small deletions is in-frame, but result in missing amino acids and potentially in altered function, perhaps explaining significant metabolic differences between the three species. A 25 kb region present only in B. suis and B. melitensis was revealed by three-way comparison to be a differentiating feature. This region, absent only in B. abortus (region MS2, Table 2), contains five glycosyl transferases (BMEII0835/0837/0840/0845-0847; BRA0420-0422/0427/0430/0432) and a succinoglycan biosynthesis transport protein (BMEII0838/BRA0429). However, no transcription of succinoglycan biosynthesis transport protein was detected by RT-PCR for either species. In B. melitensis, transcription of four out of five glycosyl transferases was detected by RT-PCR, while in B. suis transcription of only one of these genes was observed. These genes may be important in O-side chain biosynthesis – one of the known virulence determinants of Brucella . This region also contains several uncharacterized genes that may be novel virulence factors, including a putative outer membrane protein and several conserved hypothetical proteins. This region was shown to be present in B. melitensis, B. suis, B. ovis, B. canis, and B. neotomae, but not in B. abortus . Vizcaino et al. conjecture that this region is absent due to a deletion event before the differentiation of this species and its biovars, since none of the B. abortus biovars possess this region. The deletion of this island may have impacted the host range of B. abortus and pushed its divergence from the Brucella ancestor. A three-way comparison also reveals species-specific differences in two gene clusters of urease subunits present on Chromosome II of B. suis, B. abortus, and B. melitensis (ure A-G-1 BR0267-BR0273 and ure A-G-2 BR1356-BR1362 in B. suis). Some subunits of these clusters are conserved among other bacterial species, and ureases have been shown to be important to virulence in several animal models of bacterial infection . B. melitensis has a 1 bp insertion in ure A-1 (BR0268), representing a potential frame shift. A 6 bp insertion in the ure D-2 (BR1362) gene of B. abortus was identified, within overlapping segments of a highly repetitive region of the gene. In the ure E-2 gene (BR1359) of B. abortus two separate single base deletions are present, possibly shifting the frame of translation. Finally, the last 22 bp of ure E-1 (BR0271) were shown to be 100% identical in B. abortus and B. melitensis but significantly diverged in B. suis, including a 2 bp deletion. This variation within these urease gene clusters could prove to be significant to virulence differences. Our analysis revealed a cluster of transfer genes (tra/trb) unique to B. suis and potentially significant to secretion (region S2, Table 2). Transcription of all but one gene in this island was observed by RT-PCR. Several genes in this region (trbL, trbJ, traC, traJ, traI, and repA) are homologous to genes involved in mating pair formation described for Escherichia coli plasmid RP4 , to receptor complex formation in bacteriophage-host gene transfer systems , and to genes of type IV secretion systems of other species of bacteria. Agrobacterium contains both a vir B type IV secretion system and a tra/trb bacterial conjugation system. These systems are homologous and share common ancestral origins, but they are functionally independent and physically separate [25, 26]. Brucella spp. lack a conjugation system, which suggests that the genes in this region play a role in type IV secretion, or are part of an uncharacterized macromolecule or gene transfer system. The organization of this unique S2 region suggests a pattern of co-transcription. The short intergenic regions between the CDSs may indicate that these genes are organized as operons and are co-transcribed. In the case of the BRA0372-BRA0373 operon, the start codon of BRA0373 lies within BRA0372 that may indicate a -1 or -2 frame shift mechanism for transcription of BRA0373. Examples of this type of gene/operon organization have primarily been identified in viruses [22, 27]. It has also been identified in prokaryotes , although in some cases it can be an artifact of annotation error . Additional study is needed to confirm the annotation in this case. Type III secretion systems are assembled from components of flagellar machinery . Although Brucella does not normally produce flagella, our analysis reveals a flagellar gene (FlgJ – BMEI1692) present in differentiating region MA1. This gene is on Chromosome I, instead of within one of three flagellar gene clusters on Chromosome II. It is also more than twice (~640 aa) the normal size (~313 aa) for this protein. In B. melitensis, all the structural genes for flagellum formation are present but genes for the chemotactic receptors or transducers are absent . Based on the presence of several flagellar genes and a homologue of the LcrD virulence superfamily in B. abortus, it has been suggested that Brucella has the potential for motility and type III secretion . However, a recent study did not detect transcription by RT-PCR in B. melitensis grown in Albimi broth of four flagellar genes (flhB, flhP, fliR, fliF) present in B. suis, B. abortus, and B. ovis . Our RT-PCR results revealed no transcription of the flagellar differential gene flg J in Brucella grown in trypticase soy broth. Transcription was detected in ten genes within the same region MA1 that are defined as hypothetical proteins . Recent studies suggest that a flagellar gene promoter (fliF) is induced when B. suis is replicating in macrophages; additional studies on flagellar gene expression have been performed [34, 35]. It appears that at least B. melitensis can produce flagella transiently in-vitro in pure culture  and fla genes are necessary for chronic infection in mice . Thus it is likely that flagellar gene expression occurs when Brucella is replicating in an intracellular environment such as macrophages. An apparent recombinase homologue (BMEI1661) was identified as the sole unique gene for B. melitensis, and our RT-PCR results indicated that it is transcribed. There are two resolvase family genes (BME1661/BMEI0902) in the B. melitensis annotation for Chromosome I located in opposite orientations. These two genes share homology over a 180 bp consensus sequence. However, one putative recombinase (BMEI1661) is much larger than the other (747 bp vs. 231 bp). They may be considered paralogous, but BME1661 contains more than 500 bp not present in any other species. In the B. suis annotation, there are two almost identical recombinases of equal size (617 bp) present, in opposite orientations. These only have small matches to BME1661/BMEI0902 (~40 bp). However, both B. abortus and B. suis contain 2 copies of ~180 bp homologous to BME1661/BMEI0902, mostly within intergenic sequence. Overall, a 180 bp consensus is present in two copies in all three species, but ~500 bp of the BMEI1661 gene in B. melitensis is unique to this species. Site-specific recombination has been shown to be involved with acquisition of drug resistance genes and alteration of gene expression , suggesting that this unique gene may play a role in virulence. Our analysis reinforces the view that the brucellae are highly similar – much more identical to each other than are other groups of closely related bacteria. It has been suggested that the low rate of genetic exchange between Brucella spp. and other species is due to their niches within cells as intracellular parasites . However, several multi-gene differentiating islands identified in our comparison (Table 2) contain atypical G+C contents that is consistent with gene acquisition via horizontal transfer. Island MA1 exhibits a G+C content of 52% and contains a putative phage integrase family transposase at the end of the gene cluster in both B. abortus and B. melitensis. Escherichia coli has a G+C content of 51.4%, and has been demonstrated to transfer a broad host range plasmid to Brucella under laboratory conditions . Other islands have base compositions close to the average Brucella G+C content. Island SM2 exhibits a G+C content of 58% in both B. melitensis and B. suis. The presence of phage genes suggests that lysogenic conversion may have occurred . The island S2 that is unique to B. suis and containing 5 tra/trb genes has a G+C content of 55.6% and is flanked by a phage integrase homologue. Two phage gene homologues (a HK97 family phage major capsid protein and putative phage head-tail adaptor) are present within island SA1 and two phage gene homologues (a HK97 family portal protein and a phage terminase subunit) flank the island. Island SA2 contains a phage minor tail protein L homologue. This evidence is consistent with phage-mediated transduction and suggests that phages may have helped the brucellae adapt to their intracellular niches. Reverse transcription (RT-PCR) experiments were performed for all of the predicted coding sequences from the differentiating regions of B. suis, B. melitensis and B. abortus to determine whether they are transcribed in the species-specific pattern expected. When no amplicon was observed by RT-PCR, regular PCR reactions were performed to confirm the presence of differentiating sequences in genomic DNA. A total of 105 primer pairs were designed, for RT-PCR reactions targeting a total of 102 genes. Three of these were partial differentials – homologs that appeared to have significant insertions in one species relative to another in which a unique primer or probe could be placed to distinguish among species – and more than one primer pair was used in some of these cases. Figure 1 is a Venn diagram of gene content in the three species. The separate sections of the figure show (A) the number of differentiating genes identified by sequence comparison and (B) confirmed in the genome sequence by PCR, and (C) transcribed in vitro, as detected by RT-PCR. The smaller number of differentiating features in Figure 1C relative to Figure 1B signifies only that some genes which we identified as differentiating features were not transcribed under the conditions of this experiment – in vitro and in late log phase. Table 2 summarizes transcripts detected for genes in each differentiating sequence island, and Table 3 shows details of predicted vs. observed RT-PCR results for each differential gene when laboratory strains of B. suis, B. melitensis, and B. abortus were probed. The RT-PCR results agreed with the results of the comparative analysis. PCR amplification of the genomic DNA confirmed the presence of the DNA segment in all cases where transcription was not detected. No unexplained transcription was detected in any case where we had predicted that the gene probed would be absent. Further work will be required to determine if differentiating genes are transcribed in the intracellular environment, e.g. the macrophage, and what effect their transcription has on the ability of the Brucella to replicate inside macrophages. PCR and RT-PCR assays for predicted differential genes in the sequenced Brucella biovars showed that these differentials do occur in the predicted patterns. They can be used to discriminate genomic DNA from isolates of the three sequenced strains, although not all of the differentials are expressed in the late log phase. To test whether the differential sequences would be useful distinguishing the sequenced strains among a larger field of Brucella biovars we assayed 18 biovars using 24 of the 102 primer pairs. We found that ten of the PCR primer pairs tested could provide information about strain identification when other biovars were considered. The PCR results are summarized in a graphical panel on Figure 2, and the primer sequences and amplicon sizes are provided in Table 4. The presence of an amplicon from primer pair 6 is uniquely characteristic of the B. abortus strains . This primer pair was screened against the entire GenBank Database and turned to be highly B. abortus specific. The presence of amplicons from pairs 2, 3 and 4 is characteristic of all B. suis strains except 513. These sequences are also present in B. canis; additional identifying information is provided by the variable region amplified by probe pair one, as described below. Primer pair 5 was originally selected to identify B. melitensis, but was found to occur in some B. suis strains. However, primer pair 8 was able to amplify a 162 bp unique fragment in B. melitensis. Primer pair 1, which was expected to amplify a unique region in B. suis 1330, produced a single band of varying size in every one of the 18 Brucella biovars. This polymorphic region encoding for an immunoglobulin-binding protein has a potential diagnostic application. Graphical panel of PCR results in 18 Brucella biovars. The panel represents the patterns observed when PCR screening the differential regions across the 18 classical Brucella biovars and provides the values for the expected amplicon sizes. * The PCR was performed on extracted genomic DNA, rather than whole cells; green color shows size variability; red boundary indicates expected PCR amplification. Primer pairs used for PCR amplification of unique and differential regions in 18 Brucella biovars. Sequences of primer pairs, which where use to PCR amplify several differential genes across the 18 Brucella biovars along with the expected amplicon size and predicted gene function. The patterns we observed by PCR screening several Brucella biovars can be used in a simple sequence of PCR assays, which differentiates between the classical Brucella strains (Figure 3). The assay starts with an unknown bacterial culture, which is tested with a genus specific primer pair capable to amplify a DNA fragment from any bacterial strain of genus Brucella. The primer pair 6 is highly specific to B. abortus and amplifies a single band in the seven biovars that were tested. If the primer pair 6 fails to produce a fragment, the bacterial culture that we test belongs to B. canis, B. melitensis, B. neotomae, B. ovis or B. suis. The PCR primer pair 8 helps to rule out two of the Brucella species by giving a substantially shorter fragment in all three B. melitensis biovars, and no amplicon in B. ovis 1155. Primer pair 13 (5'-ACC TCG GCA TGT AAC TCA GG-3' and 5'-ACC CTC CAC ACC AAT AGA CG-3') separates B. neotomae 5K33. The next step in the diagnostic assay is to separate B. canis from B. suis. Although computational analysis identified the presence of large unique islands in Brucella suis 1330, the PCR results revealed that these islands are absent from B. suis 513 and found in the evolutionary related B. canis RM and also B. neotomae 5K33 biovars. Use of the primer pair 11 (5'-TCG GCC TGT GGA TCT ATT TC-3' and 5'-TTC CAC TTG CGT CAC TGT TC-3') can separate most of the B. suis biovars, but an additional PCR with the primer pair 12 (5'-TTG TTG GAA ACG GCT TTG ATA TCC AC-3' and 5'-GAA AGT ACC CAC CCT CGG AAA ACT CC-3') is necessary to separate B. suis 40 from B. canis RM. At every identification step additional PCR reactions may be set up to confirm the Brucella species identity. The same differential regions can be used as the discriminatory features on a diagnostic microarray. The primers used in this assay have been screened against all sequences currently present in GenBank. The primer pairs 5, 6, 9 and Control revealed significant full length matches at the nucleotide sequence level only to Brucella spp., when compared to the complete GenBank database. Primer pairs designed for these sequences were also found to be unique when compared to the complete GenBank database with BLASTn in short nearly exact match mode. Primer pairs were considered unique if both of the primers in a pair did not have a short nearly exact match hit in the same genome, or, if both did have a short hit in the same genome, the predicted amplicon was longer than 100000 bp or the primer sequence hits were shorter than 14/20 bp. We determined, using Hyther [40–42], that duplexes of 14 nt and below had melting temperatures below the annealing temperature used in the experiment. Primer pairs described as unique to Brucella spp. meet these criteria and, therefore, may be useful to verify the presence of Brucella specific DNA even in the presence of the host DNA. PCR assay which differentiates between the Brucella strains. 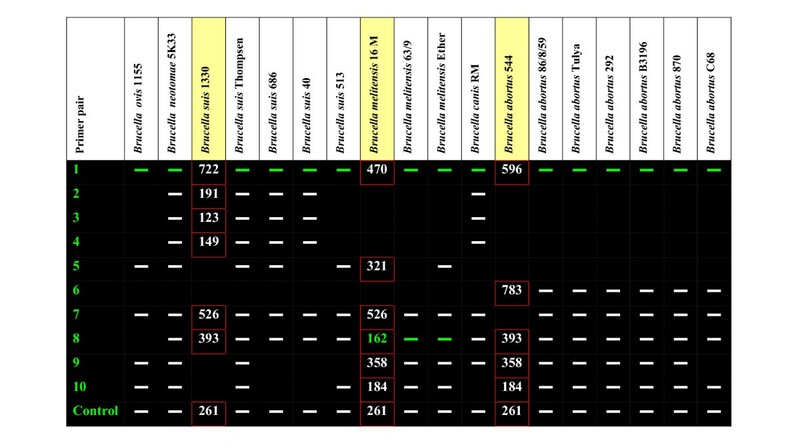 PCR assay sequence which differentiates between classical Brucella biovars based on the patterns observed by PCR screening several Brucella biovars. * The primer pair sequences are embedded in the text. Differentiating genes identified in a comprehensive whole-genome comparison among sequenced Brucella biovars have been used successfully as targets to discriminate among Brucella strains using a small number of strategically selected PCR assays. The successful differentiating targets have been placed as features on a discriminatory synthetic 70 mer oligonucleotide array for diagnosis of Brucella infections, as well as a more comprehensive Brucella array that will be used to examine differential gene expression during host-pathogen interactions. With these experiments, we hope to determine whether differences in virulence or host preferences between Brucella spp. are due to unique genes or differences in transcription and expression. The information we can obtain from differential expression studies will complement recent research in comparative proteomics of Brucella [43, 44]. None of the differentiating genes for B. melitensis that we identified have yet been detected in the proteome in vitro; however, the above proteomics study resulted in annotation of only 6% of the predicted genes in B. melitensis. We anticipate that the answers to questions about host preference and virulence will lie in the results obtained from a combination of microarray and functional analyses of mutant strains suggested by genomic analysis and global gene expression approaches. The B. abortus genome has been recently completely sequenced and annotated using Artemis releases 4 and 5 this year . As of today, the complete, annotated genome sequences of B. abortus [GenBank:AE017223, GenBank:AE017224], B. melitensis [GenBank:AE008917, GenBank:AE008918] and B. suis [GenBank:AE014291, GenBank:AE014292] are available in GenBank. 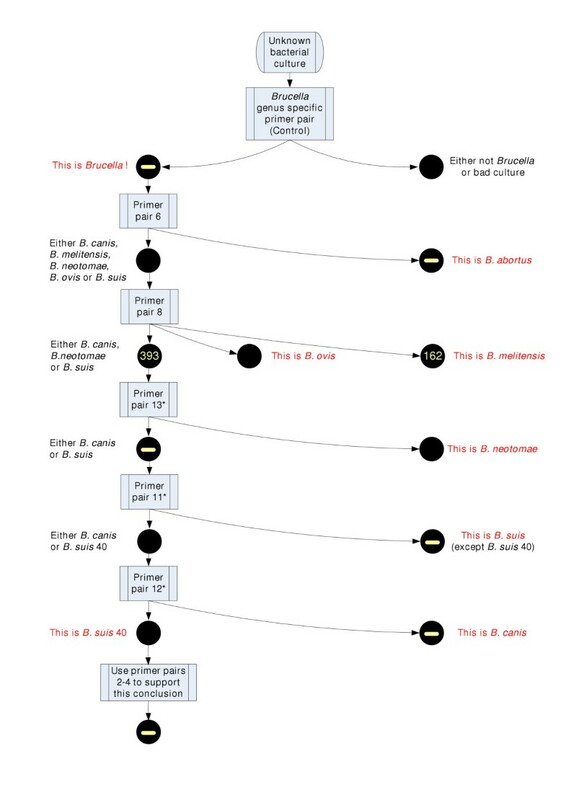 The genome of B. suis was sequenced at TIGR, and annotated using their standard procedures . B. melitensis has been annotated  using the ERGO bioinformatics suite. However, at the time this comparison was performed, a complete annotation had not been published for B. abortus. Draft B. abortus sequence and preliminary annotations were used to represent B. abortus in the three-way comparison, along with over 2,000 nucleotide sequence records for B. abortus that are available in GenBank. We used annotated coding regions from the published sequences of B. melitensis and B. suis as the basis for protein-to-protein comparisons. Pairwise whole genome alignments for each combination of genomes were performed using MUMmer (v. 2.1) . This analysis facilitates identification of regions of non-identity and single nucleotide polymorphisms between pairs of genomes with high sequence similarity. Sequence based local alignments were performed using standalone BLAST . A two-stage process using two BLAST programs (tblastx, blastn) was used to define regions of sequence match between genomes. Predicted coding sequences in each genome were translated and compared to each other. Protein sequences were also compared to six-frame-translated genomic sequence to detect homologies that lay outside annotated gene boundaries. In the case of B. abortus, no annotation was available at the time of the comparison, and this process was necessary to detect putative gene homologs. Translated genome sequences of B. melitensis and B. suis were also compared to predicted proteins from other published sequences, in order to detect possible gene homologs which may not have been identified in the published annotations. BLAST was run for each unique pairing of the three genomes. An e-value cutoff of 0.005 was used for comparisons, and the BLOSUM62 scoring matrix was used for protein-sequence-based comparisons. Genes identified in one genome, for which there were no significant matches either in coding sequence (CDS) or genomic DNA of another, were considered absent in the second genome. We observed in the genomes of these three Brucella spp. that either gene homologs existed, and had greater than 90% sequence identity, or that no apparent homolog existed; thus criteria for presence or absence of a gene were simple to establish. Differentiating genes were defined as genes for which we found no significant homology in one or both of the other genomes. A small number of gene pairs identified as matches, but having less than 80% sequence coverage of one or the other homolog, were examined more closely and classified as secondary discriminating features. Partial coverage high-scoring pairs (HSPs) for differentials were examined to determine if they could be combined to make a single match to meet our coverage cutoffs. As an additional test of uniqueness, primer pairs designed for each of the differentiating sequences were used to query the complete GenBank database in short nearly exact match mode, to identify potential annealing sites not detected in the standard BLASTn search. B. suis, B. melitensis and B. abortus cultures were grown at 37°C for 36 hours in trypticase soy broth (Difco) and harvested at an OD550 = 0.8. The culture was quickly harvested by centrifugation and re-suspended in TE/Citrate/zwittergent 3-14/lysozyme lysing buffer . RNA was extracted using an RNA extraction kit (Qiagen). RNA was quantified by spectrophotometric analysis. Residual genomic DNA contamination was eliminated by treatment with 5 units of DNAse1 (TaKaRa) for 1 hour at room temperature. Primers were designed using the Primer3 software  with a melting temperature of 60°C, G+C content of 50% and primer length of close to 20 bp using default values for the rest of the parameters. Our primers were determined using Nucleic Acid Quikfold (MFold version 3.1 and the SantaLucia free energy parameters for DNA) to have a Tm of secondary structure formation less than 40°C, and the 2-State Hybridization Server for DNA-DNA-hybrid formation  was used to verify duplex melting temperature. An existing set of B. suis primer pairs (courtesy of Dr. Ian Paulsen, TIGR), originally designed for a cDNA microarray experiment, contained primers that spanned some of the differential regions and were 100% identical to their target sequences in all three Brucella genomes; 22 pairs of primers from this set were used. We also used 81 additional forward or reverse primers from this set, and the primer or primers required to complete the pair in each case were designed by us, based on the B. melitensis or B. suis annotated genomic sequence as applicable in each case. Additional file 1 contains the sequences of all primer pairs that were used in the RT-PCR and PCR analysis of the differential regions. Reverse transcription was carried out using the Superscript first-strand synthesis system for RT-PCR (Invitrogen) following prescribed protocols. The synthesized cDNA from each Brucella species was used in a PCR reaction as the template with primers specific for each differentiating gene. Ready-to-go PCR beads (puRETaq, Amersham Biosciences) were used according to manufacturer's recommendations. Thermocycling was carried out in the gradient Mastercycler (Eppendorf). Cycling conditions were 90°C for 5 minutes, 90°C for 1 min, for denaturation 55°C for 30 seconds, for annealing 72°C for 1 min extension for 45 cycles and 70°C for 5 minutes of final extension. The RT-PCR products were electrophoretically separated on 1.5 % (TAE/TBE) agarose gels. Primers that were suspected of producing nonspecific bands were retested with a 57°C annealing temperature. When the expected products were longer than 1 kb an increased extension time of 3 minutes was used in the second round of PCR reactions, keeping all other conditions the same. The genomic DNA for the PCR reactions was extracted using a phenol/chloroform protocol . PCR reactions were performed simultaneously for all three Brucella species. The reactions were carried out in a final volume of 30 μl. Sterile water (26 μl) was added to the Amersham Biosciences puReTaq Ready-To-Go-PCR bead (each bead contains 2.5 units of PuReTaq DNA Polymerase) to give: 1.5 mM MgCl2, 50 mM KCl, 10 mM Tris-HCl, and 200 μM of each dNTP. The primer and genomic DNA concentrations were 10 pmol and 50 ng respectively. The DNA underwent denaturation for 5 min. at 95°C, followed by 40 cycles consisting of 1 min. of denaturation at 95 °C, 1 min. for primer annealing at 55°C and 3 min. extension time at 72°C, and 72°C for 10 min. of final extension. The PCR products were analyzed by 1% TBE agarose gel electrophoresis. Eighteen designated type strains of the six classical Brucella biovars [51, 52] were used to check the applicability of the identified differential regions for the diagnostic testing of Brucella species. The Brucella cells were obtained from Dr. Betsy J. Bricker at USDA, Ames Iowa, and used to set up the total of over 400 PCR reactions. The cell samples assayed included: Brucella abortus (biovars 544, 86/8/59, Tulya, 292, B3196, 870 and C68), B. canis RM, B. melitensis (biovars 16 M, 63/9 and Ether), B. neotomae 5K33, B. ovis 1155 and B. suis (biovars 1330, Thompsen, 686, 40 and 513). Originally, 24 primer pairs were selected to equally represent the unique and differential ORFs we identified. A Brucella genus-specific PCR primer pair was designed and used as a positive control for the PCR assay of the differentiating regions. This primer pair was screened against all sequences from all organisms currently deposited in the GenBank Database, and is expected to be extremely Brucella specific. Each set of PCR reactions also contained a no DNA contamination control. The PCR was performed on methanol killed bacterial cells, which is a commonly used diagnostic technique [53, 54]. The cells were diluted in water down to 0.2-0.15 OD550 nm the night before the PCR analysis. The PCR amplification was performed using the PCR SuperMix from Invitrogen, with 55°C primer annealing temperature and 1 minute elongation time. The amplification products were then separated on the 1.6% agarose gel in a sodium borate buffer. We are grateful to Dr. Ian Paulsen at the Institute for Genomic Research for supplying PCR primers for the B. suis genome. Portions of this study were funded by Dr. James Blair, Associate Provost for Interdisciplinary Research and Dr. Gerhardt Schurig, Director of the Institute for Biomedical Sciences and Public Health at VA Tech and Cooperative Agreement No. 58-3625-2-142 from the USDA to Dr. Stephen M. Boyle. We are especially grateful to Dr. Betsy Bricker of the National Animal Disease Center (Ames, Iowa) for generously supplying the methanol killed Brucella biovars, and Nancy Tenpenny for extraction of B. abortus 544 genomic DNA and its PCR testing. Dr. Bruno W. S. Sobral, Director of the Virginia Bioinformatics Institute, provided support for the participation of Dr. R. Lathigra and Dr. O. He. VGR participated in the design of the study, carried out the PCR screening of Brucella biovars and drafted the manuscript. DMS performed the computational analysis and drafted the manuscript, SR performed the RT-PCR analysis of differentiating genes. SAR performed the PCR analysis of differentiating genes. YH, RL and NS helped to analyze the data and critically revised the manuscript. SMH contributed the draft genome sequence of B. abortus and critically revised the manuscript. SMB and CJG conceived of the study, and participated in its design and coordination and helped to draft the manuscript. All authors read and approved the final manuscript.